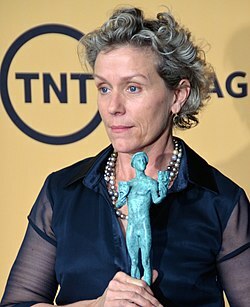 1985 神探亨特 Nina Sloan Episode: "The Garbage Man"
1986 Spenser: For Hire Mary Episode: "A Day's Wages"
^ 奧斯卡最佳女主角！Frances Mcdormand：其實我是好萊塢邊緣人｜女人迷 Womany. 女人迷 womany.net. 2018-03-05 [2018-03-24] （中文（台灣）‎）. ^ 中時電子報. 必看！第75屆金球獎完整得獎名單. 中時電子報. [2018-01-08] （中文（台灣）‎）.